In lieu of flowers memorial donations may be made to Children’s Mercy Hospital and left at the funeral home. 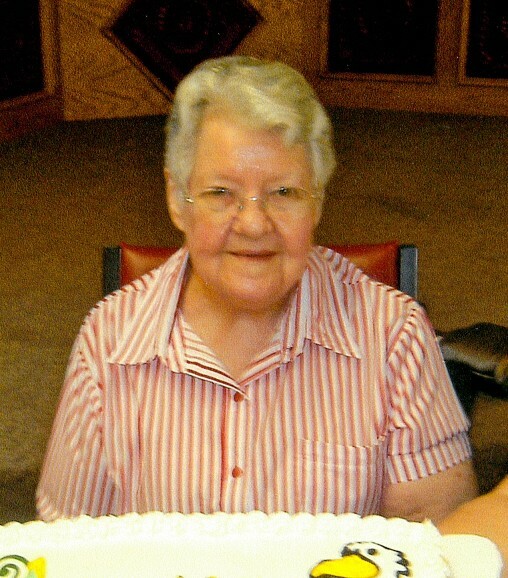 Lucy Marie Dade, age 91, of El Dorado Springs passed away on Tuesday morning, August 19, 2014. Lucy was born November 5, 1922, in Mt. Vernon, Ohio, to Orley Lee Davis and Anna “Myrtle” Walker. Lucy met Elton Dade in Palm Springs, California, and they were married in Yuma, Arizona, on January 12, 1943. She cherished their love and fifty-six years together. Elton and Lucy spent their early years together moving around due to Elton's Air Force career. They later settled in Harwood, MO. Lucy helped Elton operate a RV repair business prior to settling on the family farm. Lucy spent her remaining years with Elton in El Dorado Springs being active in the Nevada and El Dorado Springs Eagles Lodge. Lucy knew the Lord and was a God-loving Christian. Lucy enjoyed and loved her family too. She enjoyed traveling with Elton. She was especially fond of attending her grandson's and great-grandson's sporting events. Lucy was a beautiful, special woman. She was tough too. She provided her family a wonderful example of how to live their lives. Preceding Lucy in death were her husband, Elton; her parents; her brothers: Wilson Davis, Wilber Davis, and Charles Davis; and her sisters: Ruth Long and Betty Burney. iends on Thursday evening from 6-7:00 p.m. at Bland-Hackleman Funeral Home. Funeral services for Lucy Dade will be held on Friday, August 22, 2014, at 10:00 a.m. at Bland-Hackleman Funeral Home. Rev. Ron Marsh will officiate and Rusty Carver will provide music. Burial will follow in Greenlawn Cemetery under the direction of Bland-Hackleman Funeral Home.